Passenger trains are usually classified by their average speed and they offer a host of facilities in seating arrangements and pantry services among others if the distance is long and needs overnight journey. There are several classes of travel depending on the distance and speed of the train. The slow passengers have only unreserved seating class whereas Rajdhani, Duronto, Shatabdi, garib rath and yuva trains have only air-conditioned classes. The fares for all classes are different with unreserved seating class being the cheapest. The fare of Rajdhani, Duronto and Shatabdi trains includes food being served but the fare for other trains does not include food that has to be bought separately. In long-distance trains, a pantry car is attached for serving food at the berth or seat itself. Luxury trains such as Palace on Wheels have separate dining cars buy the ticket fare for these services cost more than a five-star hotel room. A standard passenger rake generally has four unreserved (also called "general") compartments, two at the front and two at the end, of which one may be exclusively for ladies. The exact number of other coaches varies according to the demand and the route. A luggage compartment can also exist at the front or the back. In some mail trains a separate mail coach is attached. Lavatories are communal and feature both the Indian style as well as the Western style. At the rear of the train is a special compartment known as the guard's cabin. It is fitted with a transceiver and is where the guard usually gives the all clear signal before the train departs. This is a rail service plying between a central district and adjacent suburbs of that city to cater to the daily commuters who depend on such a fast network for official and personal needs. In metros like Mumbai, Chennai and Kolkata there is an exclusive rail network for running suburban trains which carry a huge population from the city hubs to the outskirts on a daily basis. They are also referred to as local trains by the public. Usually the suburban operations n India share the network with other passenger and freight trains as in Lucknow and Kanpur or a combination of dedicated suburban lines and lines for long distance trains like the Mumbai metro. However, the entire rail infrastructure is owned and maintained by the IR and local railway zones take full responsibility over them. In recent years, the advent of rapid rail transit system has led to drop In the patronage of suburban trains by commuters. Suburban trains ferrying city commuters are mostly electric multiple units (EMUs). They usually have 9-12 coaches and sometimes they have extra rakes to handle rush hour traffic. One unit of an EMU train consists of one power car and two general coaches. The rakes in some of the suburban rails run on direct current and others on alternating current. Metro cities have their exclusive suburban networks to cater to commuters. But the suburban rail systems in Hyderabad, Pune, Barabanki-Lucknow, Lucknow-Kanpur and Bengaluru do not have dedicated tracks and hence, share tracks with long distance trains. In Chennai and Mumbai, the suburban rail services have dedicated tracks, but they also avail the rail lines of long-distance trains. 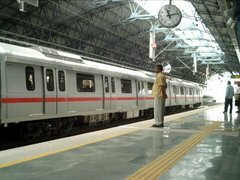 According to the IR sources, a suburban rail system is being planned for Ahmedabad, Kochi and Thiruvananthapuram. More than 70 per cent of the IR's income comes from transporting a range of cargoes like minerals, metals, construction materials, foodgrains, vehicles and other manufactured products over long distances. Most of the profit from the freight services has been used to cross-subsidise the loss-making passenger sector. Major ports and metros have their own dedicated freight network and yards set up with the help of the IR. However, competition from trucks which offer cheaper rates has seen a decrease in freight traffic in recent years. The Indian Railways has laid down detailed freight operational and marketing strategies for the X Five-year plan to regain the lost market share. Since the 1990s, Indian Railways has switched from small consignments to larger container movement which has helped speed up its operations. Most of its freight earnings come from such rakes carrying bulk goods such as coal, cement, foodgrains and iron ore.
Indian Railways also transports vehicles over long distances. Trucks that carry goods to a particular location are hauled back by trains saving the trucking company on unnecessary fuel expenses. Refrigerated vans are also available in many areas. The "Green Van" is a special type used to transport fresh food and vegetables. Recently Indian Railways introduced the special 'Container Rajdhani' or CONRAJ, for high priority freight. The highest speed notched up for a freight train is 100 km/h (62 mph) for a 4,700 ton load.